Easily connect across corporate and enterprise firewalls. Whatever the network environment or blocked IP, our firewall-traversal feature keeps your users connected. Allows your applications to work in corporate environments. No extra maintenance work or costs for your network administrator. Ensures calls continue through blocked IP. Out of the box connectivity. You will not incur any extra maintenance work or costs. We offer seamless support for STUN and TURN, so your developers don’t have to worry about setting up, scaling, or maintaining these servers. Our firewall traversal capabilities work out of the box, allowing your customers to connect without any extra work. 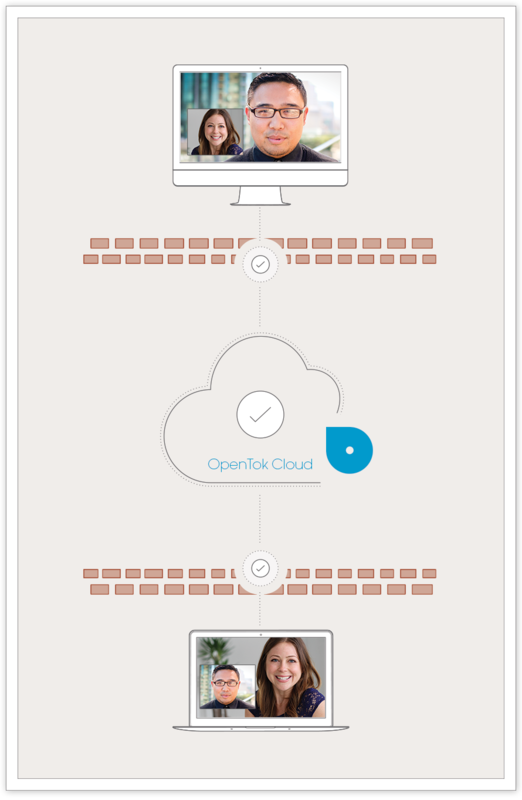 Whether they’re behind a corporate firewall or blocked IP, or in a strict enterprise environment, OpenTok helps your users connect whenever, wherever. We know that connectivity is king. This is why we offer a connectivity doctor and other tools that help you diagnose network challenges and optimize ecosystems to ensure your applications will work. Learn more about Configurable TURN.